Many attics have problems with mold growth due to the humid nature of the space. Poorly ventilated and under-insulated attics are at an especially high risk for mold problems. Mold in the attic can cause serious health problems for the home's inhabitants, reduce a home's value, and lead to structural damage. Dr. Energy Saver Of Connecticut can help you prevent mold problems in your home with our Mold-X2 system. This two part system treats affected areas to eliminate mold growth and prevent future occurrences. If you're interested in keeping your attic healthy and mold-free, call us today at 1-855-201-5406 or click below for a free estimate on the Mold-X2 system. We offer our mold prevention services in Stamford, Norwalk, Hartford, New Haven, Danbury, Greenwich and throughout the surrounding areas. 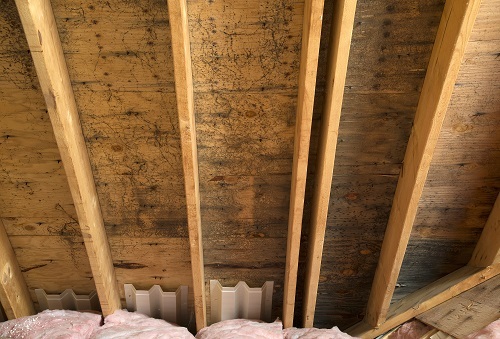 This attic developed mold growth due to poor ventilation and insulation, which created the damp environment mold needs to grow. Treating the attic with Mold-X2 eliminates the mold growth to restore the clean surface. Mold-X2 Botanical will then be applied to prevent further growth. Mold-X2 Stain Remover: The Mold-X2 Stain Remover is used to clean contaminated surfaces, which usually consists of exposed wood or drywall in the attic. The application of this product will eliminate dark stains and discoloration from mold growth, restoring the appearance of the surface. Mold-X2 Botanical: Mold-X2 Botanical is an anti-microbial that is applied to prevent future mold growth. This treatment makes the surface resistant to mold growth and doesn't pose any health risks to humans or pets. Mold-X2 Botanical also leaves a pleasant smell instead of a chemical odor. Moisture and organic material are necessary for mold to grow. Your attic has organic material in abundance in the form of wood and other building materials, so the challenge is preventing moisture. Moisture in the attic is typically caused by warm air leaking through the ceiling into the attic and condensing. This process can happen every time you turn on your furnace, eventually leading to mold growth. We can help prevent mold growth through air sealing and attic insulation. Air sealing eliminates the gaps and cracks in the attic that allow warm air from your home to reach the attic, preventing moisture from gathering. 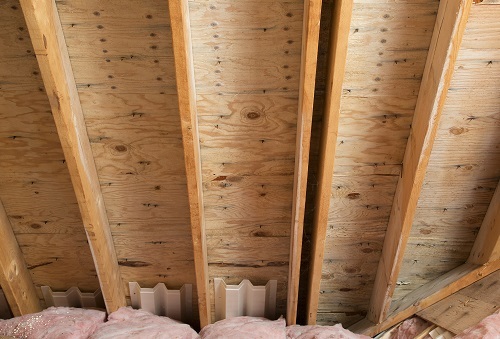 Attic insulation will create a thermal barrier that helps ensure the air you pay to heat stays in the living space. If you have problems with mold in your attic, Mold-X2 from Dr. Energy Saver Of Connecticut is the solution you need. Our system is proven to treat attic mold and prevent regrowth, allowing you to enjoy a healthier, cleaner home. If you're interested in attic mold prevention or any of our other attic insulation services, call us today at 1-855-201-5406 or contact us online to get a free estimate! We offer all our services in Stamford, Norwalk, Hartford, New Haven, Danbury, Greenwich, Darien, New Canaan, Westport, West Hartford, Ridgefield, Hamden and the surrounding areas.